WASHINGTON (Sputnik) — On July 4, 2015, US media outlet The Daily Beast reported that there were “no doubts” that the Azov Battalion was a neo-Nazi militant group that is leading the fight against independence supporters in eastern Ukraine. Is the US Training Ukrainian Neo-Nazis? US mainstream media, Chossudovsky argued, condemns the neo-Nazis in the military on one hand while claiming the government in Kiev is free of fascist tendencies and wholly committed to democracy. StopImperialism.com editor and geopolitical analyst Eric Draitser told Sputnik that a trickle of US media coverage regarding the presence of Nazis in the Ukraine military will not change US policy nor will it change the narrative in Washington. “The narrative of Ukraine as having been caused by ‘Russian aggression’ is firmly implanted in the public psyche in the United States after 18 months of propaganda from both major parties and every major media outlet,” Draitser claimed. 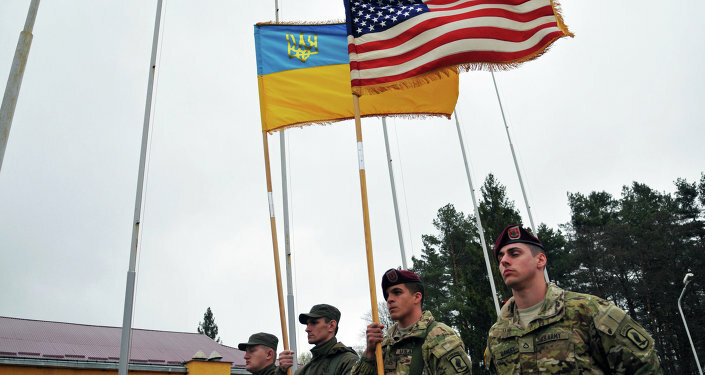 On June 12, 2015, the US House of Representatives passed amendments to the country's Defense Spending Bill to block the training of Ukraine's Azov Battalion. International watchdogs, including Human Rights Watch, have repeatedly expressed concerns over crimes against civilians committed by Azov and other Ukraine paramilitary groups. Amnesty International said in September 2014 that the Ukrainian government should bear responsibility for the war crimes and human rights violations committed by its volunteers.